There was no shortage of area public officials at two remembrance ceremonies for the Sept. 11 tragedies 16 years ago this week. Selwyn Harris/Pahrump Valley Times Pahrump Valley Fire and Rescue Services Chief Scott Lewis, rear-right, applaudes area first responders during Monday's 9/11 remembrance ceremony at the Calvada Eye. 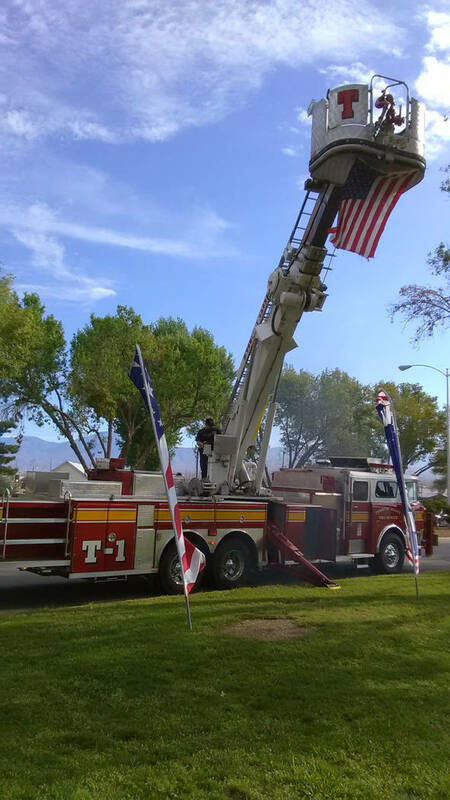 Selwyn Harris/Pahrump Valley Times Pahrump Fire Chief Scott Lewis brought along the department’s Tower Ladder One fire truck to both 9/11 remembrance ceremonies on Monday. That particular apparatus was in service at the time of both terrorist attacks on the World Trade Center in New York City. 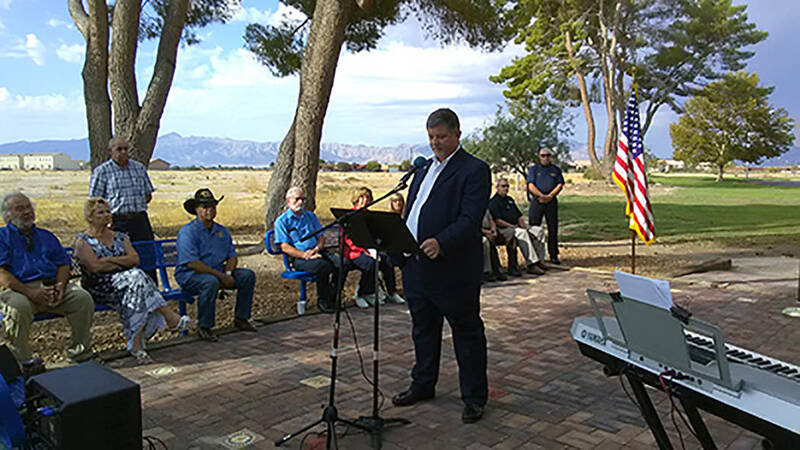 Selwyn Harris/Pahrump Valley Times Nevada District 36 Assemblyman James Oscarson provided numerous thoughts and remarks on the 9/11 tragedy, which took place 16 years-ago on Monday. Oscarson was one of several officials who took part in the ceremony. Selwyn Harris/Pahrump Valley Times Nye County Sheriff Sharon Wehrly recalled how much the country changed in the aftermath of the September 11, 2001 attacks, 16 years ago. 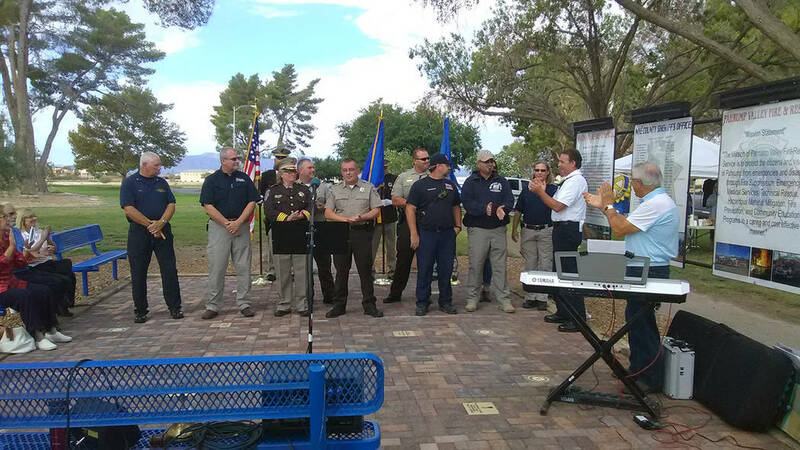 The first ceremony, hosted by the Rotary Club of Pahrump, was held in the First Responders Reflection Area at the Calvada Eye at 8:30 a.m. Monday. Nevada District 36 Assemblyman James Oscarson was among several guest speakers who addressed the more than two-dozen residents, veterans and first responders. Oscarson, R-Pahrump, also spoke of the bravery and gentleness of all first responders. “We forget the firefighter with the caring and gentle guiding hand,” he noted. “Before the fire, before the burglar, and before the heart attack, do we remember how much money, training and sacrifice goes into a firefighter fighting a fire, an officer entering an unknown dark home or business, or a paramedic’s exposure to dangerous infections? Do we remember? 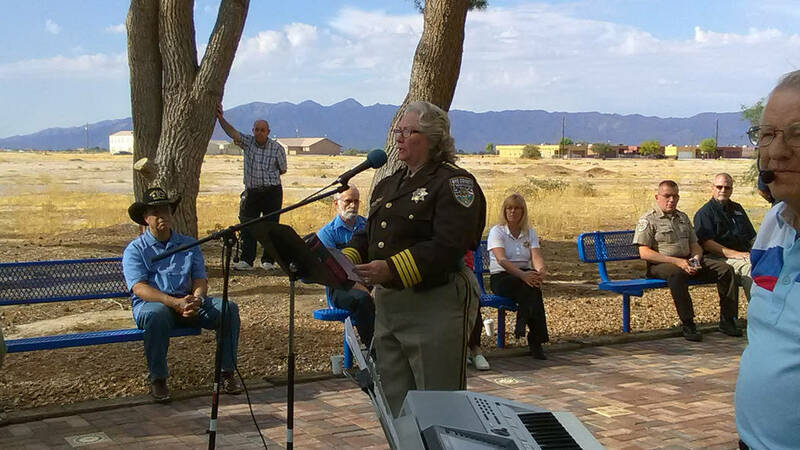 Nye County Sheriff Sharon Wehrly talked about the aftermath of the terrorist attacks, as well as the memories etched into the minds of those who actually witnessed the tragedy on Sept. 11, 2001. “The planes didn’t fly,” she recalled. “For the first time in some of our lives, there was no noise from above. There was chaos on the ground. People were stranded, but they weren’t mad at the airlines or the government. They were mad at the perpetrators of this egregious act. Additionally, Wehrly spoke about how the events on that day changed the mindset of many United States citizens, for the betterment of the entire country. The sheriff also addressed the price of freedom in American society. As she closed out her remarks, Wehrly said the 9/11 tragedy brought back memories of other infamous attacks on America. Several other guests in attendance also provided their respective comments on Sept. 11, 2001, including Nye County commissioners Butch Borasky and John Koenig. Nye County District Attorney Angela Bello provided remarks, along with acting Undersheriff Michael Eisenloffel. Pahrump Valley Fire and Rescue Services Chief Scott Lewis also provided his thoughts on the tragedy. Lewis brought along the department’s Tower Ladder One firetruck which was in service at the time of both terrorist attacks on the World Trade Center in New York City. An evening Sept. 11 remembrance ceremony was also held on Monday at the corner of Basin Avenue and Highway 160. The local Disabled American Veterans chapter organized the evening ceremony.